Shortly after 3.30pm, a few minutes behind schedule, 27 men that had won seats in the General Election entered the Round Room of the Mansion House, on Dawson Street in Dublin. They were greeted by prolonged cheers from the men and women that had gained entry to the room. Demand for tickets for entry had been so swift the week previous, that the Sinn Féin HQ in Harcourt Street were forced to halt ticket distribution merely an hour after they had begun after over 1,000 tickets were snapped up. Over 60 journalists were present. Special correspondents that had been sent from America, Canada, France, Spain, Belgium, and South Africa joined their Irish counterparts. Correspondents from every major British newspaper were also in attendance. A hush fell over the packed gallery once Count Plunkett, who had led the FDEs (Feisere Dáil Éireann, the term Teachta Dála was favoured, and adopted during the first meeting, however) began to speak in Irish. He proposed that Cathal Brugha be appointed President of the assembly for the day. This was unanimously agreed to and the Dublin man, representing Waterford County became the first leader of an Irish legislative assembly since John Foster, the last speaker of the Irish House of Commons before the Act of Union. In addition to these 27, the names of Harry Boland and Michael Collins were also read out as present. 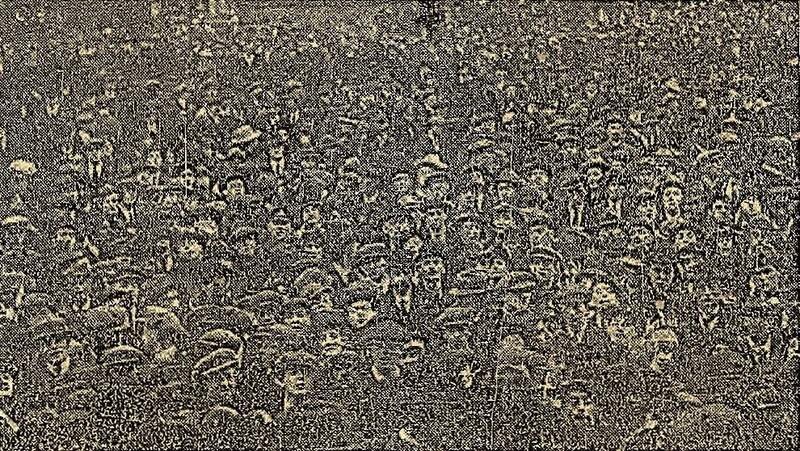 They were, however, on a mission to have Eamonn DeValera released from Lincoln Jail in England. And Whereas the Irish people is resolved to secure and maintain its complete independence, in order to promote the common weal, to re-establish justice, to provide for future defence, to promote peace at home and goodwill with all nations and to constitute a national policy based upon the people's will, with equal right and equal opportunity for every citizen; and Whereas at the threshold of a new-era in history, the Irish electorate has, in that General Election of December, 1918, seized the first occasion to declare by an overwhelming majority its firm allegiance to the Irish Republic. Now, therefore, we, the elected representatives of the ancient Irish people, in National Parliament assembled do, in the name of the Irish Nation, ratify the establishment of the Irish republic, and pledge ourselves to make this declaration effective by every means in our power to ordain that the elected representatives of the Irish people have the power to make laws binding on the people of Ireland and that the Irish Parliament is the only Parliamentwhich that people owe its allegiance. We solemnly declare foreign government in Ireland to be an invasion of our national right, which we will never tolerate, and we demand the evacuation of our country by the English garrison. We claim for our national independence the recognition and support of every free nation of the worId, and we proclaim that independence to be a condition precedent to international peace hereafter. In the name of the Irish people we humbly commit our destiny to Almighty God. We gave our fathers the courage and determination to persevere through lonq centuries of a ruthless tyranny, and strong in the justice of the cause which they have handed down to us, we ask His Divine blessing on this this last stage of the struggle which we have pledged ourselves to carry through, to Freedom. Proceedings concluded with Count Plunkett reading a message to the Free Nations of the world in French, and the nomination of Plunkett, himself, Eamonn DeValera, and Arthur Griffith as Ireland’s representatives to the ongoing Peace Conference in Paris. Crowd gathered outside the Mansion House before the first meeting of Dáil Éireann. Irish Independent, 22nd January 1919. Constables [James] McDonnell and [Patrick] O’Connell were shot dead by masked men while escorting a quantity of gelignite to Soloheadbeg Quarry, about 6 miles from Tipperary Town. The attackers seized the gelignite and drove away. The Government has determined to proclaim the district as a military area immediately. The gelignite was being taken away in a horse and cart from the military barracks to the quarry for blasting purposes. The two constables walked beside the cart with loaded rifles accompanied by Patrick Flynn, an employee of the County Council, who was in charge of the explosives. The driver of the cart was James Godfrey. According to a statement made by Flynn to our correspondent between 12.30pm and 1pm a dozen masked men suddenly jumped over the roadside fence near the quarry and shouted hands up. At the same moment he heard a bang and the two constables fell on the road. One of the men got into the cart and drove away in the direction of the quarry with the gelignite. The others took the policemen’s rifles and ammunition and went away in the direction of Coffey’s Forge. 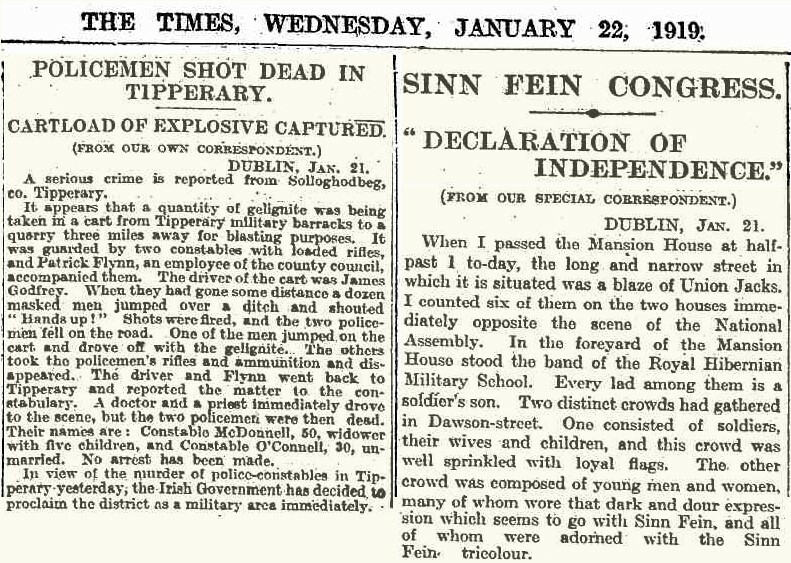 The Times of London reporting on the two important events in Ireland that took place on 21st January 1919. With feelings of the deepest regret we record the death of Mrs. Odlum, wife of Mr. R. E. Odlum, J.P., New Park, Maryborough, on Tuesday evening last, surrounded by a devoted and loving family, whose untiring solicitude and care have made the evening of her life one of happiness and content. Mrs. Odlum was the daughter of the late Mr. P. Hinds, member of one of the oldest and most respected families in the Queen's County, and during the long life which Mrs. Odlum had spent in Maryborough whether as maid or wife she attracted and retained the lasting affection and esteem of all classes. By a-large circle of relatives and friends her loss will be poignantly felt, but in the family circle a void will be left that can never be filled. The family now left to mourn her loss—happily she lived to see them reach man and womanhood—are sufficient testimony to the maternal care and affection which she bestowed upon them throughout her wedded life. The death occurred during the week in Athy of an old person who had occasionally been in receipt of relief and whose miserly habits were well known. A small quantity of gold was found on the premises of deceased for which there was a scramble, and the temporary ownership of which may be the subject of legal proceedings. A very pleasant function took place on last Thursday evening, when Mr Liam Hoolan was entertained to dinner by his colleagues, the staff of the North Tipperary County Council on his release from Belfast Prison, where he had undergone six months' imprisonment for drilling. Mr Hoolan, health was enthusiastically drunk, special references being made by all present to his honesty of purpose, his good fellowship, his devoted services to the cause, his rigid and unbending devotion to the highest national ideal. In reply Mr Hoolan referred to the splendid spirit that had always existed amongst the staff; the letters he had got every week in Belfast showed he had not been forgotten ; it was a pleasure to him to know that, and the kindness of his colleagues would ever remain a cherished memory of his heart. As to anything he had done for Ireland, he only did what he conceived to be his duty, and if greater calls come he hoped they would not find him unprepared to do his duty equally. I wish to contradict some statements made by Mr Hayes, Organiser of the Local Transport Workers' Union, when interviewed by your representative and subsequently published in last Saturday's "Guardian." From the weekly returns handed in by my foreman the output was 15. not 16 or 17 sacks per week as stated. Therefore, the rate per sack for week worked out at 5s 4d. As a matter of fact, my bakers were paid on a flat rate, i.e., the same wage the whole year round. Thus, when the weekly output was reduced from 15 to 11 or 12 sacks, as happens at certain seasons, the rate per sack would be about 7s. As to a sack wage my men refused to be paid by the sack. In fact, a comprehensible statement of their demands could not be elicited from them. Hence my application to Mr Hayes for a written statement. There is a suggestion, whether intentional or not I cannot say, that I attempted to hoodwink Mr Hayes by saying that I had given up the bakery business, altogether, whereas I was being supplied with bread from Limerick. My message to Mr Hayes, which was unmistakably delivered in these terms, was that I had given up baking until conditions improve and I can improve my baking accommodation. My position in this matter, therefore, is that I have given up baking until I wish to resume. Meanwhile I have taken on an agency for bread. Among other considerations is my unwillingness to carry on business at the caprice of men who can at any time formulate unreasonable demands, leave without notice when they are not conceded, and get a trade union to take up such a dispute. I have been accused in handbills circulated last Saturday of a desire to kill trade unionism in Nenagh. In conclusion, I wish to say I have no quarrel with trade unionism, but I refuse to be a victim of trade despotism. Thanking you for the favour of publication.